Epoxy Resin Adhesive: Provided in coordinated colors to match Duratop epoxy sinks and laboratory counter top materials. Epoxy adhesive is a two-component pigmented epoxy resin compound of resin and hardener for use in application and installation to join countertops, splashes or finishing sink applications. 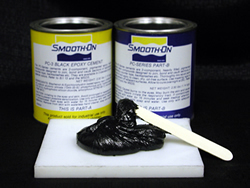 Smooth-On PC-3® Lab Top epoxy cement is a two-component, black epoxy resin compound designed to join, bond and caulk sections of laboratory counter top seams and splashes. The Smooth-on epoxy resin is also used to attach lipped drop-in type or under counter mounted epoxy sinks to the lab counter tops and for sealing the drain outlet waste to the sink opening. Epoxy resin adhesive is also suggested by architects for bonding the counter top materials to the base cabinets of steel or wood casework. The epoxy resin cement is heavily filled, contains no volatile solvents and will adhere to vertical surfaces without sagging, and sets at room temperature with extremely low shrinkage. It is chemically stable and bonds strongly to natural and artificial stone, and thermosetting resins such as polyester, phenolic and epoxy. PC-3 is available in pint units (1.5 lbs each, part "A" and "B" resin and hardener) and a case of pint cans contains six units and weighs 20 lbs. Smooth-on PC-3 set time is approx. 1-2 hours depending on the combination of temperature and humidity. Mixing ratio is one to one by weight or volume. Notice: It has been determined that hard ordinary tap water contains minerals that may discolor Smooth-on Epoxy adhesive. The recommendation is to use clear isopropyl alcohol, clear thinner, acetone or mineral spirits for smoothing joints and clean-up of lab counter tops. PC-3 Black Epoxy adhesive will freeze at sustained temperatures below 32 degree F. If a freeze has taken place, bring the products into a warm enclosed room and allow to recover at room temperature for a period of time. Stir each part “A” and “B” individually and then mix 1 to 1 ratio for proper application. Epoxy Curbing: Typically offered as 100mm (4") back splash or curbing, cut to size for field application. Also available Molded as an Integral molded 4", 6" or 8" (100, 150 or 200mm) cove curb backsplash. See details in Duratop epoxy specifications. or in an "L" shape configuration attached to the surface while covering the front edge as well. Heights of the front edge range from 3/4" to 1.25" (19mm to 32mm). Unapplied Marine Edge (UME) Duratop epoxy flat strips are used for field attachment with Epoxy adhesive on the top surface of counter top material to form a marine edge or no-drip edge and offered in +1/4" (7mm) thickness. Color matching epoxy adhesive is available for attachment. Marine edges are also offered as integrally molded on certain sized sheet materials. UME Strips are NOT sold without epoxy sheet materials. UME strips are only available in Black Epoxy. Duratop Epoxy strips can be field applied to 3/4" (19mm), 1" (25mm) or 1.25" (32mm) thick epoxy or solid phenolic resin countertops to form a no-drip marine edge. countertop face up to 1.45" (37mm) as well as the top surface in order to provide a uniform epoxy no-drip edge treatment to the work surface material. UME "L" shaped strips are NOT sold without epoxy sheet materials and only available in Black Epoxy. Pegboards: Produced in five alternative materials of Duratop Epoxy, Resistop Solid Phenolic, Dura-Line Acrylic, Stainless Steel and LabArt Molded Polypropylene. See the pegboard section on the home page for details on all products. Cup Sinks, Traps, Outlets and Overflows: Produced in either epoxy resin or polypropylene for use in fume hood bases, counter top drain areas, etc. See the sinks or Polypropylene sections for further details. Under Counter mount & Lipped Drop-In Epoxy sinks , cup sinks, troughs, and more are produced in 10 matching colors to compliment or contrast to the work surfaces. 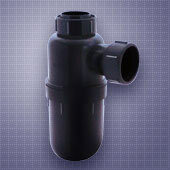 All required accessories, such as drain outlets, overflows, stoppers, basket strainers, etc. are available to compliment the sink materials.